Sometimes the most difficult time to be a parent is at the grocery store. We've all been there. Your kid sees something they want and when you tell them "no" chaos erupts. Imagine how difficult it is for parents of children with sensory processing issues and Autism Spectrum Disorders. For these kids going to the grocery store is being assaulted with hundreds of sounds, sights, and smells. If you really want to know how these kids feel turn on a strobe light, blast the radio and TV and turn on the washing machine. Ok...now spin in a circle until you don't know where you are. Now do you understand why these kids are screaming in the middle of the store? My daughter has Sensory Integration Disorder and when she was younger she would have the most awful melt downs in the store. I used to get dirty looks and rude comments. Most of the time I would leave the store and cry in the car on my way home. Every once in a while there would be one understanding person who would give me a smile or help me out to my car. Thank God for people like this. Mine is a little fancier than the simple ones I would send out. For this reason I have decided to wear an Autism Awareness Ribbon on my shirt or jacket every time I go to the grocery store. By doing this I hope to let parents of SID and ASD kids know that they are not alone and there are those of us that understand and sympathize. 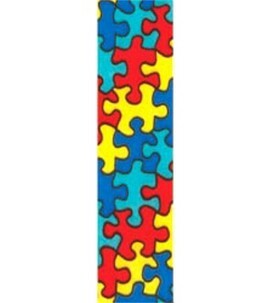 The puzzle pattern ribbon is easy to find. I got mine at Michael's and I have seen it at JoAnn Fabric and even Walmart. You can make your own or if you would like me to send you one just shoot me an email at Macy@Craftyconfessions.com. I'm hope to see lots of these ribbons around the store in the future. 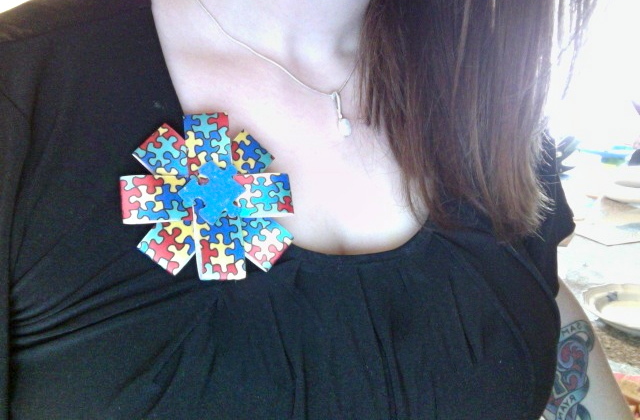 I clicked on your link, and I really like the flower pin idea. Both of my sons, who are two of my three blogging partners in crime, are autistic. Pop by if you'd like. We like to let people know what they have to look forward to in the future with their little geniuses. I saw this on Tatertots & Jello's Weekend Wrap-Up. One of my sons has sensory disorder, too, and is borderline aspergers. For a few years, we just didn't take him to the store at all, because it was so difficult. Love your ribbon idea! This is great. My son has Autism and SPD, and when we are in public I always want him to wear a shirt that says "I have Autism" and then wear one for myself that says "Be nice to me, my son has Autism." When people realize, they are so much nicer....but before that.....well.... Your pin is super cute! Regaurdless you should wear it. We have something going on with our children and the medical world needs to figure out what is causing it- My friend Nicole's son has Austin- her blog is http://www.momnivores-dilemma.com. I would love it if you posted to WorkShop Wednesday. Lets make people aware. Hi I featured your post this week @ WorkShop Wednesday. Stop by and grab a featured button. Thanks for joining the party!